Scheduling a specific time for tasks can be a real chore. How do you schedule something that doesn’t really have a date associated with it? Still, a few tasks have at least some relationship to your calendar. Taking out the trash is a good example of how tasks can relate to your schedule. You probably don’t want to waste time by taking out the garbage when there’s only a little bit in the basket, but you probably do want to take it out before the trash haulers arrive at 8 a.m. Monday morning. In the spirit of keeping things as simple as they deserve to be, your Pocket PC keeps the Tasks options to a minimum. To set the few Tasks options that do exist, first open the Tasks application by clicking the Start button and choosing Tasks from the Start menu. Then tap Tools –> Options to display the list. Set reminders for new items: Makes certain that your Pocket PC will nag you about any new tasks you add to your list until you mark them as completed. Show start and due date: Ties tasks more closely to your schedule by adding in a date when you should start the task and a date when the task must be completed. Use large font: Displays your tasks in large characters so that they’re harder to ignore. Pick the blend of options that works the best for you and then click OK to return to the Tasks list. If you don’t need to know the starting and due dates for your tasks, leave the Show Start and Due Date check box deselected. When this option is selected, each task requires an extra row on your screen — even if these dates aren’t filled in. To add yet another job to your electronic job jar, tap New on the Tasks menu. You can also display the Entry Bar above your list of tasks by selecting Tools –> Entry Bar, but this really just takes up an extra row to do something you can do just as well by tapping New. 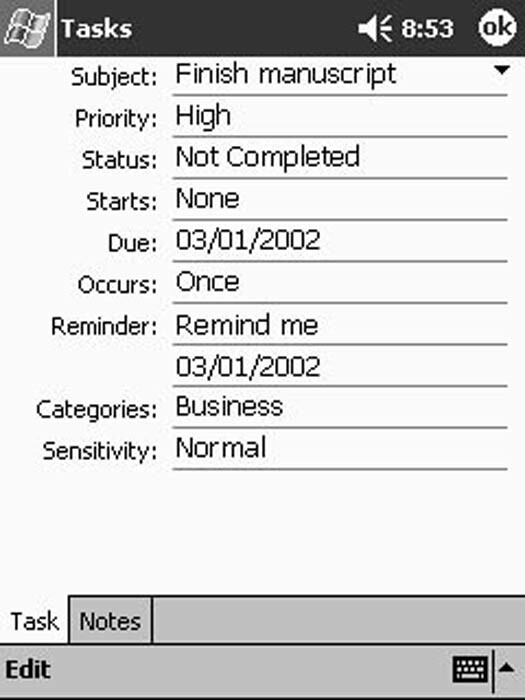 You cannot set specific times (although you can set dates) for tasks. Tasks can be set to different priority levels, and your Tasks list can be sorted to show which tasks are most important. You don’t have to set any dates for tasks if you don’t want to. Giving the dog a bath can wait until you’re darn good and ready! Figure 1: When you have things to do, put them in your Tasks list so that you know when you’re ignoring them. As your list of stuff that needs to be done grows, you’ll probably want to figure out which items you can continue to put off and which ones you’re just going to have to do. One way to do this is to sort the list. You can choose to sort your task list by Status, Priority, Subject, Start Date, or Due Date — depending on which order is easier for you to ignore. The drop-down list shows the different sorting options you can choose. When the list is not dropped down, the sorting option you’ve selected replaces the words Sort By. You can also use categories to help organize your tasks. Some good choices may be “Yeah, right,” “Forget it,” and “Geez, do I really have to?” You’ll have to add these categories yourself. For some reason, they aren’t default categories that you can select.